Easter Sunday is a time for family, celebration and shared meals – and Salt Creek Grille has all three on the menu for its annual Easter Sunday Brunch. A hit for the whole family, this beautiful buffet of gourmet selections is available for walk-in diners, or reservations for parties of seven or more, from 9 a.m. to 3 p.m. on Sunday, April 21; adults are $46.95 and Kids under 12 are $16.95. Begin your meal with unlimited complimentary champagne, perfect for a family toast and casual sipping throughout a relaxed meal. Specialty roasted and hand-carved meats will be deliciously displayed to tempt meat-lovers, and succulent chilled seafood will entice those looking for a more decadent main course. The custom fresh pasta bar is made-to-order in front of you, as the chef adds fresh ingredients and hand tosses the dish to perfection. 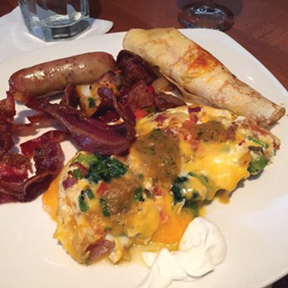 Do you prefer breakfast dishes for your brunch fare? The made-just-for-you omelet bar serves up fluffy eggs packed with hand-picked ingredients in a full-sized portion. Farm-fresh breakfast favorites – from smoked sausage to bacon and eggs – are served alongside gourmet breakfast selections, including eggs benedict. Don’t forget to stop for some fresh fruit and aebleskivers, a rare and delectable treat. Other special dishes include chicken and mushroom-stuffed crepes, chef-prepared salads and, for the grand finale, an extraordinary display of hand-crafted desserts. For more information or to make a reservation, visit Salt Creek Grille at 24415 Town Center Drive #115, call 661-222-9999 or visit www.saltcreekvalencia.com.